New items will be ready next week or soon after - cucumbers, French fillet beans, basil, and kale. And to top off this great harvest week, there was a lot going on behind the scenes too. We got another entire greenhouse weeded. Shain did more planting. Also, this farming family sneaked off for a 4 day trip to Utah to visit relatives. With school starting soon (Shain is a school teacher), this was probably out last chance to get away for a while. At least until "the grandbaby" comes. That's right! Our daughter Megan is having a baby. (If you click on the Instagram link, right column, you can see a picture taken this weekend.) Unfortunately, she did not coordinate with me on this one and our little granddaughter will come before the farm season ends. So things are going to be interesting around here real soon. With the great Workshares we have, it's likely you'll never even notice my absense for a few days. And our son Eli leaves for college in a few weeks too. Big changes happening around this place. Another great share harvested with the help of some great people! Thanks to our Workshares for helping us pull this off every week! And, a LOT of weeding got done this week too! A very busy busy week. Looking around the farm, there are several new crops that are ready to harvest. It's the time of year when we can enjoy the bounty of summer! Eat well my friends. Speaking of eating well, Shain has been cooking up some amazing dishes. Last week he created one of the best tasting lasagna's I've ever eaten! Recipe here. If you missed last week's newsletter, you really need to try his Veggie Stir Fry recipe with Cilantro Lime Sauce. Shain also recently cooked something he calls "Pasta Primavera" which is basically a white cream sauce, similar to a simple alfredo, poured over pasta and sauteed vegetables such as carrots, squash, and zucchini. And to top it all off, all of these recipes and meal ideas are plant based and a great way to eat the fresh organic foods grown right here in Star Valley. This share is HUGE! Approximately 16 pounds of fresh, organic produce. This lot would sell for nearly $50 at the Jackson Farmers Market! What a great haul! (And to be honest, it was a magic trick getting it all into one bag.). Our garlic harvest is DONE! It's all hanging to dry in a shed, which will take a couple of weeks. A VERY BIG THANKS goes out to all our Workshares this week! To harvest such an amount of food AND finish our garlic harvest - in the same week! - is something I am so proud of. We can't do this each week without their great help! 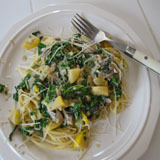 Shain has created a new wonderful meal made from the veggies in your recent shares. I love it so much I told him he could make it every day! Vegetable Stir Fry with Noodles and a Cilantro Chile Lime Sauce. We are also enjoying Egg Rolls on a regular basis. And a nice zucchini lasagna is in the oven as I type this up. What are you making with your weekly share? Have a great week and ENJOY your veggies? Garlic, fresh - at least one "nice" one and some "ugly" ones that we culled out from our big garlic dig this week, damaged but still delicious! Chinese Cabbage - watch out for earwigs! Carol spent a LOT of time cleaning these up, but there are layers of leaves and hiding places for dirt, wood chips, and earwigs. Beware and be careful. I'm so happy to say that half our garlic is up and hanging in the shed to cure. We will get the other half done next Wednesday. Garlic is a BIG, time-consuming project. Plant in the fall. Weed a few times (mostly just Shain going down the rows with the tiller), digging it all up, bunching and hanging til it's dry, and then clean it all up for our CSA shares and to sell. As we dig, we find bulbs that are "ugly" or some get stabbed with the shovel. We clean up some of these bulbs too and put in them in the shares because who doesn't like extra garlic? It was a fun challenge putting the shares together this week. You know there's a lot of food when we have to get out the twisty-ties to hold some bags closed. And it appears as though we are officially at that point in the season where I walk around the farm and say to myself "I have no idea how we are going to harvest all of this!" And somehow we do. Every week. But if you ever have some free time on your hands, we'd love a little extra help! 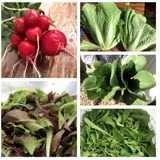 New foods that will be in your shares soon: Swiss chard, cucumbers, snap peas, and golden beets! *It's one thing to be weeding and suddenly feel like you have a spider or earwig crawling up your arm, it's another to be assigned to dig up the last of our Japanese Turnips and be covered in aphids. YUCK! A big thanks to Carol and Mary who went above and beyond today, making magic out of that row of infested, partially rotten, and really stinky turnips. They cleaned up okay and we hope you enjoy them because that's it for the season. A really good rainstorm on our newest row of outside salad greens made for a little extra time and effort when harvesting and washing up this week's salad mix. As you can see, the rains kicked dirt up on the greens which made for a morning of playing in the mud. Thankfully, the rain didn't damage the fragile leafy greens (hail would have ruined it completely) and it only took some extra time to clean up nice. It's all about looking really good for bugs and bad leaves and then a nice final clean rinse. Lots of eyes on this week's delicious salad mix. And now that we are growing this crop outside, it's going to be like this every week when we harvest salad. Bronze Fennel is not a common herb to most people. Our new CSA members will wonder "What is this?" Sometimes called Bronze Fennel Fronds or Ferns, we started growing this licorice-flavored herb a few years ago at the request of a Jackson Hold chef. Most of our recipe suggestions came from him, but you can also find many ideas online. Shain loves it when I make fennel tea, same process as I've described before (for the chamomile) but we especially like a fennel + mint combination. Served warm with honey, or ice cold. A few small ferns (or coarsely chopped) are a nice addition to a salad. Finely chopped and added to melted butter (and other ingredients like lemon or mustard) to make a quick and tasty sauce for meats or roasted veggies. Some people feel Bronze fennel can replace fresh dill in any recipe. Can be an ingredient in a fresh salad dressing. Bronze fennel is very easy to dehydrate to make tea or other recipes all winter long. Farmer Shain says our first planting of carrots in greenhouse 2 are ready to harvest! They will be in our shares next week. Other crops that will be ready very soon are cilantro, golden beets, summer squash, Chinese cabbage and hopeully the snap peas (the plants are loaded with blossoms!). Garlic Scapes - a lot! Last of the season. If you aren't going to use them fresh, I hope you'll take some time to preserve these for use later. They can be cut up quickly with scissors and frozen in snack sized baggies, or dehydrated (which can then be pulverized to make garlic scape powder). Pesto is quick and easy to make and freezes very well. Japanese Turnips - leafy greens were cut off because of aphids. This crop is almost done for the season, we hope to get one last picking next week (though with this upcoming heat I can't say for sure if they will make it). Chamomile - enough to dry for making tea this winter. Now that the weather is really warming up, I got the okay to remove the row cover from our zucchini plants (they have grown quite well with all the pampering we've given them) and pick our first batch of zucchini, just enough for each CSA share to get one. And the plants are loaded with blossoms. Now begins the time of year when I need to remember to go pick zucchini 3 times a week. And you probably want to get out your favorite zucchini recipes because there will be an abundance. The summer squash were uncovered today too, but they are at least a week or two behind. We (this includes our great crew of Workshares) have been able to get a LOT of weeding done in the last week. And each time we weed, it helps the crops grow so we can harvest them more quickly. Just a week ago we weeded a long row of spinach and that allowed it to grow so I could cut it this week. The spinach is bolting, but we got one good cutting from it and it will be interesting to see how it grows back. Other crops recently weeded, which we expect to harvest soon, are beets, carrots, cilantro, bronze fennel, and boc choi. Join us for some weeding therapy on the farm - early in the morning in a greenhouse or later in the day outside in the sunshine. It always pays off with more good food to eat. And just like clock work, it's the 4th of July and the heat turns up in Star Valley so the crops start growing a little more quickly. Your share will only continue to get bigger and better each week from here throughout the season.